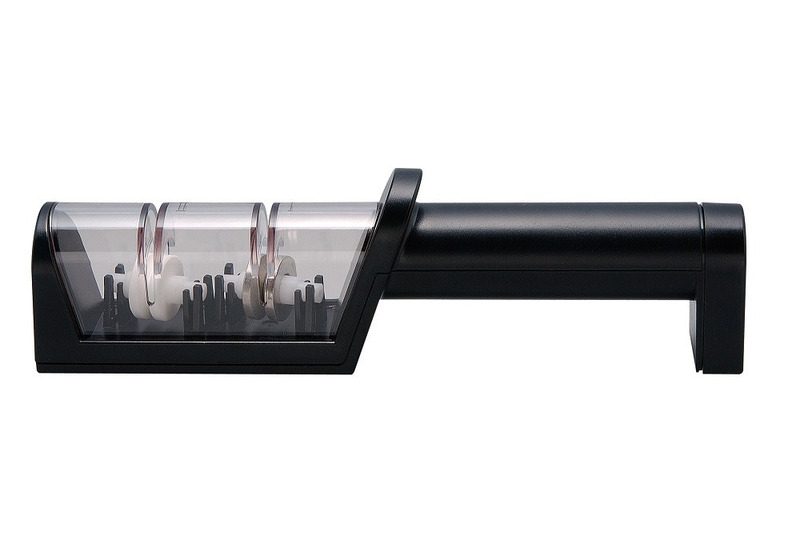 With the Miyabi knife sharpener with ceramic rollers, your knives can be sharpened more smoothly and in greater comfort. The sharpener features a pre-set sharpening angle so that your knife is always in the right position. The blade is first pulled through the diamond-coated roller several times to achieve a beautiful cutting edge. The knife is then pulled through the ceramic rollers several times at the end of the sharpening process. This makes the knife exceptionally sharp so that it can effortlessly cut through meat, fish and other foods. Silicone grippers help the knife sharpener stay stable as you work so that it doesn't slip. The ergonomic handle is made from easy-care plastic and can be comfortably held by both left-handed and right-handed chefs. This knife sharpener can also be used to sharpen non-serrated knives made from different steel types, as well as knives from the Miyabi range. With this Miyabi knife sharpener, sharpening your knives couldn't be easier. The hand guard ensures the safe use.